Seaver Napkin Set Pure white linen. Stain-resistance and waterproof. Many color and pattern options. Set of 4. 100% cotton with acrylic coating one side. Made in France. Within pure white linen border, interwoven gold or silver metallic yarns. Plain weave, Hemstitch. Garland, Amaryllis, Stanza, Joy Pure linen guest towels. Exquisite embroidery. Made in Washington U.S.A.
Winter Pineapple & Winter Pear | ANALI Expertly embroidered guest towels. Pure linen. Made in Washington U.S.A.
Fraser Fir Candle & Aspen Candle Forest scented. Premium wax blend. No soy. 14 and 8 ounce. Handmade in the U.S.A.
Limited Edition. 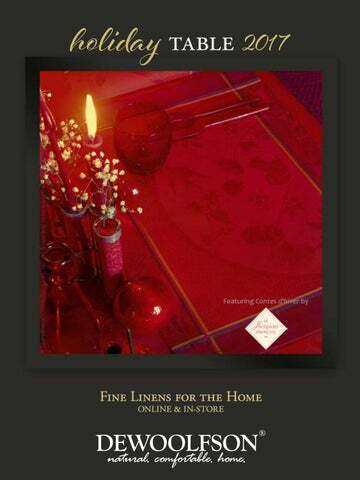 Jacquard tablecloths, napkins, placemats, runners. 2 colorways. Made in France. Each pair packaged in a silk pouch. Made from the finest silk we've found. Generously sized. A DEWOOLFSON Gift Card is the perfect gift for that oh−so−dear, yet hard−to−buy−for person in your life. You decide the amount and we will email them the wonderful news inside a lovely card. Simple & sincere. Create your Gift Registry at dewoolfsonlinens.com – the perfect and easy way to create a wish list for yourself or someone else.